Students enter school with a variety of mental and physical health needs, and school nurses are on the front line of addressing them. Juaquin has his head down again. Is he asleep (again) or not feeling well (again)? Nevaeh is back after being gone for nearly three weeks at the beginning of the school year. Will she be able to catch up? Clara made it to class, but she seems distracted. Can she focus on today’s lesson? And so it goes. Every teacher confronts such questions, and all teachers worry about those students who appear to be struggling with health issues and other challenges in their personal lives. But when students don’t show up in class, or when they show up but their minds seem to be elsewhere, what are teachers to do? According to state and national data, chronic absenteeism — which has a profoundly negative effect on student achievement — is closely correlated with ongoing and/or unmet health care needs (U.S. Department of Education, 2016). For example, in a recent survey of high school students in Florida, 92.4% of respondents indicated that health reasons were “sometimes” or “usually” the cause of their absences (Brundage, Castillo, & Batsche, 2017). Among the various home and community factors that influence students’ ability to learn, the availability of local health services stands out as one of the most important. However, the nature and quality of those services matter just as much as their availability. 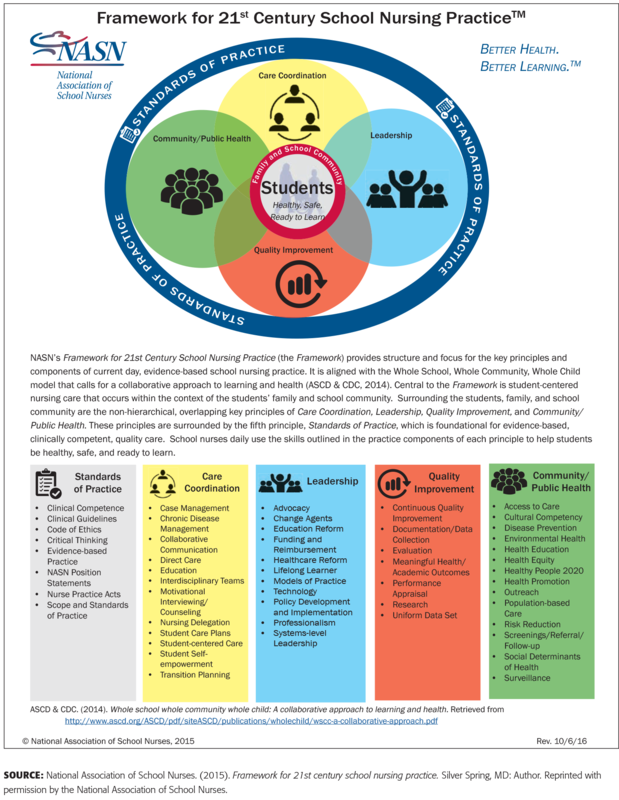 As detailed in the widely praised Whole Child, Whole School, Whole Community model developed by ASCD and the Centers for Disease Control and Prevention (CDC, 2014), student health care must not be left to a single doctor or clinic working in isolation. It takes a well-coordinated team to meet st udents’ health needs effectively, and no member of that team is more critical than the school nurse. For example, a school nurse is perfectly positioned to perform an initial assessment of Juaquin’s needs to determine whether he might have a chronic condition like diabetes, an acute tooth infection that’s causing pain, mental distress caused by a chaotic family situaton, or some other reason for being tired and unwell. As a member of the school attendance team, the nurse could have flagged Neveah’s early absences and followed up to see if she had a serious illness, a transportation issue, or another problem. And the nurse could have checked in privately with Clara to see if her distraction might have to do with being bullied, skipping breakfast, struggling with anxiety, coping with a physical ailment, and so on. Traditional assumptions about school nursing — focusing on ice, lice, and Band-Aids — often cause nurses’ work to be misunderstood and devalued. However, the World Health Organization has found that schools are one of the most consistent and appropriate locations to address young people’s health needs (Baltag, Pachyna, & Hall, 2015). And as a growing body of evidence points to the complex ways in which health and learning are connected, it becomes ever more clear that the proper role of school nurses goes well beyond dealing with mild bumps and bruises (NASN, 2015). With nearly 20% of students entering school with a chronic health condition, such as asthma, life-threatening allergies, diabetes, and seizure disorders (U.S. Health Resources and Services Administration, 2016), school nurses provide direct care (checking blood glucose, providing treatments) to students with these needs; empower students to manage their own chronic conditions; and work with students’ healthcare providers, school staff, and the community to coordinate students’ needs. At the same time, school nurses can detect illness early, prevent its spread, and identify students at risk, while also advocating for the well-being of the entire community. Nurses also help students stay in school: A student is more likely to be able to go back to class (instead of being dismissed early) when seen by a school nurse, compared to a non-licensed health professional (Pennington & Delaney, 2008). A school nurse has the knowledge and expertise to assess the issue and determine if it is a health concern that the nurse can address so the student can stay in school. Those without such training must send the child home. A recent national workforce study estimates there are approximately 121,300 school nurses (86,800 full-time employees) in public schools across the nation (Willgerodt, Brock, & Maughan, 2018). Yet, 18.1% of schools do not have any paid school nurse at all, and many others have only a part-time school nurse. Even full-time school nurses may not spend all their time in one school — over half (55.9%) of school nurses cover more than two schools. These figures vary across the country, though. Schools in the Northeast are more likely to have a full-time school nurse, and those in the West are more likely to have one nurse cover multiple schools, or not have a school nurse at all (Willgerodt et al., 2018). Traditional assumptions about school nursing — focusing on ice, lice, and Band-Aids — often cause nurses’ work to be misunderstood and devalued. The National Association of School Nurses (NASN, 2016a) recommends each school have a full-time nurse with a baccalaureate degree in nursing. A nurse who serves a single school full time is better able to form a strong relationship with students and their community, which enhances the nurse’s clinical judgment. Yet only 33.7% of school districts indicate they have a policy requiring schools to have a full-time school nurse, and only 18.1% of districts required schools to have at least a part-time nurse (CDC, 2017). What’s more, over the past 16 years, the percentage of districts with a policy requiring a newly hired school nurse to be a registered nurse (RN) decreased by 16.6% (CDC, 2017). In some cases, school nursing positions have been cut, and in others they’ve been filled by a licensed practical/vocational nurse (LPN) or an aide. Much as classroom aides can assist but not replace a teacher, LPNs and aides can help support an RN but do not have the skills or license to perform some critical nursing tasks such as assessing the whole child, developing care plans, providing health counseling, and performing complex treatments. Aides and LPNs can assist in routine activities, such as applying a simple Band-Aid, but a registered nurse has the expertise and skills to assess and address the student’s needs from a holistic perspective. In accordance with state laws of nursing practice, LPNs and aides must be supervised by an RN. Further, some school and district leaders have argued that school-based health centers (SBHC) can replace school nurses. However, their roles are very different. SBHCs are primary care clinics providing diagnostic tests and treatments much like a doctor’s office. Students must be enrolled in the clinic, and eligible insurance may be billed. They can be critically important in locations where other community healthcare providers are lacking. In contrast, school nurses provide health counseling to assist and empower students in managing their chronic health conditions on a daily basis. They also identify and address the social determinants in the family and community that affect students’ health. In addition, school nurses provide a population-based approach to the entire school community, proactively identifying communicable infections, health trends, or potential threats that affect groups of students and providing population-based interventions to address the situation (NASN, 2016b). While SBHCs and school nurses can be great partners in which school nurses identify students in need and direct them to the SBHC, one does not replace the other. School nurses bridge the worlds of health care and education, but most (76.7%) are funded solely through education dollars (Willgerodt & Brock, 2016). Thus, when education dollars are stretched thin, school and district leaders often let go of their school nurses. However, school nurses could easily be funded through other agencies, such as local health departments and hospitals. Indeed, some districts and schools have come up with creative ways to pool funding from multiple sources to support their nurses (Becker & Maughan, 2017). For example, most state Medicaid laws allow schools to bill for specific services and then direct the reimbursed funds back into nursing positions (though only a little more than half of schools do so; Willgerodt & Brock, 2016). Regardless of how nursing positions are funded, however, they provide a strong return on investment, especially in the areas of immunizations, mental health services, and the treatment of chronic conditions. For instance, every state requires that if students are not adequately immunized, they must be excluded from school. In schools that employ nurses, rates of immunization compliance are higher (Keck et al., 2013; Salmon et al., 2004; Wilson et al., 2013), which also results in stronger herd immunity (meaning that fewer vaccine-preventable infections spread to those who cannot be immunized). Thus, fewer students miss valuable learning time, which translates to less need for tutoring and other academic services, and fewer teachers call in sick. Overall, researchers have found, every dollar spent on immunization saves between $16 and $44, depending on whether the calculation includes costs related to medication, lost work production, hospitalization, and treatment (Ozawa et al., 2016). Because 13 to 20% of students suffer from bullying, anxiety, stress, depression, and similar concerns, school nurses are on the front line of addressing mental health problems, too (Bohnenkemp, Stephan, & Bobo, 2015; Perou et al., 2013) — roughly a third of all visits to school nurses have to do with mental health issues (and related psychosomatic symptoms, such as headaches and stomachaches). This doesn’t mean that school nurses should replace school social workers or psychologists, who can provide more intensive and long-term support. However, by identifying and responding to mental health concerns early on, nurses play a critical role in providing appropriate interventions and steering young people to the services they need (Gilbert et al., 2015). School nurses can also be part of an interdisciplinary team to help address students’ mental health needs. Here, too, the potential cost savings are significant: Researchers in Canada found that for every dollar spent on timely treatment of mental health problems and addictions, $7 is saved in healthcare costs, and $30 is saved in lost productivity and societal costs (Ontario Ministry of Health and Long-Term Care, 2009). Regardless of how nursing positions are funded, they provide a strong return on investment, especially in the areas of immunizations, mental health services, and the treatment of chronic conditions. School nurses also help students with chronic health problems better manage their conditions, leading to improved attendance (Moricca et al., 2013; Telljohann, Dake, & Prince, 2004) and decreased early dismissal (Hill & Hollis, 2012; Pennington & Delaney, 2008). Mary Baisch, Sally Lundeen, and M. Kathleen Murphy (2011) found that a nurse could save principals nearly an hour (46 minutes) addressing health concerns that arose when the school nurse was not present. They calculated that the cost per school savings would be $133,174.89, or $1.84 saved for every dollar spent on school nursing. Another study, using data collected from the Massachusetts School Health Services Program, found that for every dollar spent for school nursing services, $2.20 was saved (Wang et al., 2014). But this study only accounted for the cost of parents’ time off work, teachers’ time, and the cost of treatment. Because school nurses also address prevention, both individually with students and for the entire school community, the financial benefit may be even greater. Consider, for example, the finding of Trust for America’s Health (2009) that for every dollar spent over five years on community prevention activities that targeted smoking and exercise, $5.60 was saved. These same kinds of savings could apply to school nursing programs. 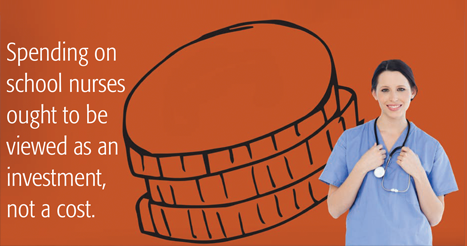 These examples suggest that spending on school nurses ought to be viewed as an investment, not a cost. Since their benefits extend beyond schools and into the broader community, cash-strapped educators should look to community partners to help fund them. Across the country, public healthcare systems are now looking to create interdisciplinary approaches to treatment and prevention, with teams of clinicians, social workers, and others collaborating on efforts to improve health outcomes. School nurses can and should be included in these teams, as they are the healthcare providers students and their families see on a regular basis. They help students manage their health conditions and address many of the home and social factors other providers and educators may not realize are issues or have the time to address. Because school nurses are able to build trusting relationships with parents and caregivers, they may be able to intervene when families have no health insurance, need assistance with medications, or lack food, shelter, and other basics. The CDC estimates an additional $1,377 to $9,059 in medical care for each child who has asthma, diabetes, or seizure disorders (Miller et al., 2016). School nurses could help lower these costs by identifying students with chronic conditions early, helping them manage their conditions, and empowering them to stay healthy. Addressing these problems not only helps improve student health and well-being but it also keeps parents and caregivers healthy and able to work. Thus, for business leaders, elected officials, insurance companies, and others, supporting local school nurses is a sound investment not just for students and schools, but for the entire community. Baisch, M.J., Lundeen, S.P., & Murphy, M.K. (2011). Evidence-based research on the value of school nurses in an urban school system. Journal of School Health, 81 (2), 74-80. Baltag, V., Pachyna, A., & Hall, J. (2015). Global overview of school health services: Data from 102 countries. Health Behavior & Policy Review, 2 (4), 268-283. Becker, S.I. & Maughan, E.D. (2017). A descriptive study of differing school health delivery models. The Journal of School Nursing, 33 (6), 415-425. Bohnenkemp, J.H., Stephan, S.H., & Bobo, N. (2015). Supporting student mental health: The role of the school nurse in coordinated school mental health care. Psychology in the Schools, 52 (7), 714-727. Gilbert, L.K., Breiding, M.J., Merrick, M.T., Thompson, W.W., Ford, D.C., Dhingra, S.S., & Parks, S.E. (2015). Childhood adversity and adult chronic disease: An update from ten states and the District of Columbia, 2010. American Journal of Preventive Medicine, 48 (3), 345-349. Hill, N.J. & Hollis, M. (2012). Teacher time spent on student health issues and the school nurse presence. Journal of School Nursing, 28, 181-186. Keck, P.C., Ynalvez, M.A., Gonzalez, H.F., & Castillo, K.D. (2013). School-located influenza vaccination and absenteeism among elementary school students in a Hispanic community. Journal of School Nursing, 29 (4), 271-283. Miller, G.F., Coffield, E., Leroy, Z., & Wallin, R. (2016). Prevalence and costs of five chronic conditions in children. Journal of School Nursing, 32 (5), 357-364. Moricca, M.L., Grassaka, M.A., Marthaler, M.B., Morphew, T., Weismuller, P.C., & Galant, S.P. (2013). School asthma screening and case management: Attendance and learning outcomes. Journal of School Nursing, 29 (2), 104-112. National Association of School Nurses. (2016b). School nursing and school-based health centers: Working together for student success. Silver Spring, MD: Author. Ontario Ministry of Health and Long-Term Care. (2009). Every door is the right door: Towards a 10-year mental health and addictions strategy: A discussion paper. Toronto: Ministry of Health and Long-Term Care. Ozawa, S., Clark, S., Portnoy, A., Grewal, S., Brenzel, L., & Walker, D.G. (2016). Return on investment from childhood immunization in low-and middle income countries, 2011-20. Health Affairs, 35 (2), 199-207. Pennington, N. & Delaney, E. (2008). The number of students sent home by school nurses compared to unlicensed personnel. Journal of School Nursing, 24, 290–297. Perou, R., Bitsko, R.H., Blumberg, S.J., Pastor, P., Ghandour, R.M., Gfoerer, J.C., … Huang, L.N. (2013). Mental health surveillance among children-United States, 2005-2011. Morbidity and Mortality Weekly Report (MMWR), 62 (2), 1-35. Salmon, D.A., Moulton, L.H., Omer, S.B., Chace, L.M., Klassen, A., Talebian, P., & Halsey, N.A. (2004). Knowledge, attitudes and beliefs of school nurses and personnel and association with nonmedical immunization exemptions. Pediatrics, 113, e552-e559. Telljohann, S.K., Dake, J.A., & Price, J.H. (2004). Effect of full-time versus part-time school nurses on attendance of elementary students with asthma. Journal of School Nursing, 20, 331–334. Wang, L.Y., Vernon-Smiley, M., Gapinski, M.A., Desisto, M., Maughan, E., & Sheetz, A. (2014). Cost-benefit study of school nursing services. JAMA Pediatrics, 168 (7), 642. Willgerodt, M. & Brock, D. (2016). NASN school nurse workforce study. Seattle, WA: University of Washington. Willgerodt, M.A., Brock D., & Maughan, E. (forthcoming, 2018). School nurses in the US: The National School Nurse Workforce Study. Journal of School Nursing. Wilson, D., Sanchez, K., Blackwell, S., Weinstein, E., & Amin, A. (2013). Implementing and sustaining school-located influenza vaccination programs: Perspectives from five diverse school districts. Journal of School Nursing, 29 (4), 303-314. Citation: Maughan, E.D. (2018). School nurses: An investment in student achievement. Phi Delta Kappan 99 (7), 8-14. ERIN D. MAUGHAN (emaughan@nasn.org; @ErinNasn) is director of research at the National Association of School Nurses in Silver Spring, Md. This is an EXCELLENT article. I’m sending this to our state governor. In Texas school nurses are not mandatory. I think I’ve proven to our school district the value of having a school nurse on campus of one or more buildings. I have been an LPN for 44 years, working no at different hospitals, Dr.s offices, and have been a school nurse for going on 10 years! My lead nurse is an RN and she trusts my judgement. A school nurse doesn’t have to have her BSN to know what they are doing! Common sense is a big plus also! I have 480 students that are kept in school and are for the most part very healthy! I care for type1 diabetics daily and am in touch with their Dr.s and office nurses if they have problems! We work for little pay, long days, and angry parents! Name calling rude folks that feel you should be Dr., Lawyer, and total caregiver to their children! Sarah -LPNs are very valuable and I don’t think this article was discounting that at all. I started as an LPN but knew that my opportunities were limited so made the choice the to get my RN. LPNs cannot function independently – per the Nurse Practice Act – you have to be supervised by an RN – that’s just the way it is. I’m sure after 44 years you have learned a lot- I know I have after 39 years. Don’t be defensive. I feel that I should be able to be credentialed as a Certified School Nurse but I can’t and my school is not going to let me go because I’m not. I’m sure that if you have been at your school for 10 years, they must love you! What a well written paper. Just as hospitals and health care facilities push for Magnet status with the hiring of Master’s prepared RN’s, I agree that our schools benefit from an RN in the building as well. I have been an RN for over 20 years, with the last 12 in the school setting and have had population totals from 650 to 3000 with myself as the only nurse in the building. The acuity and increase in schools mandates a nurse for optimal health care and academic success of our children. Thank you so much Erin for writing this outstanding article to spread the word about school nurses and why it is important to have a RN in each school. I work in an elementary school which the parents and students depend on the school nurse for pretty much everything. At my school, their are several challenges that the students and parents face so I just try to do my best to make a difference in the lives of every student.